Specialty CME Credits: Included as part of the 4 credits, this CME activity is eligible for 0.5 Pharmacology CME credits, subject to your state and institutional approval. The wide range and vague nature of clinical presentations of thyroid emergencies make accurate and timely diagnosis challenging. Patients with a variety of thyroid conditions present to the emergency department, and appropriate suspicion can reduce unnecessary delay and expense in determining the correct diagnosis. This issue reviews the current evidence for presentation, evaluation, and treatment for emergencies of thyroid function and anatomy including hypothyroidism, hyperthyroidism, thyroid nodules, and thyroid trauma. Complications of thyroid dysfunction are also considered, as well as recommendations for disposition and follow-up. 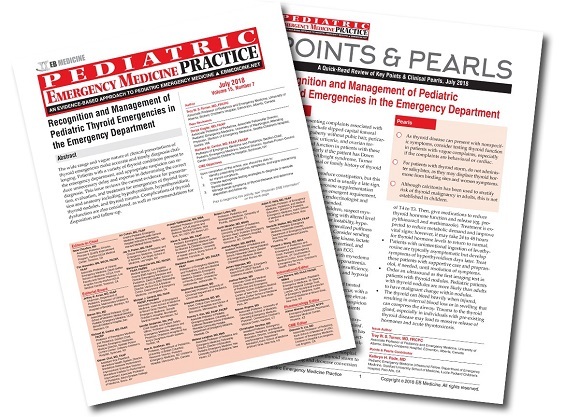 A 4-year-old boy presents to your ED, asymptomatic after suspected ingestion of 25 tablets of his grandmother’s 300-mcg levothyroxine. The ingestion occurred 90 minutes ago. You wonder: Is this amount toxic? Would serum hormone levels be helpful? What symptoms would be concerning? How should this patient be managed? An 8-year-old boy with a history of Down syndrome is brought in by his parents because he is lethargic. He is difficult to rouse and has a history of vomiting and diarrhea for the last 4 days. His parents say this is very unusual for him, as he is usually constipated. The boy responds slowly to voice and shows signs of dehydration on examination. His mucous membranes are tacky, his capillary refill is 4 seconds, and he has cool extremities. The patient’s heart rate is 135 beats/min and his blood pressure is 100/60 mm Hg. A review of systems reveals no recent weight change, no unusual hair growth, and no temperature intolerance. In the waiting room, oral rehydration by syringe has been unsuccessful. While you suspect that dehydration is the cause of this patient's condition and begin to calculate fluid replacement, you recall that constipation can be a symptom of thyroid disease. Should you check the patient's thyroid stimulating hormone level while you start intravenous rehydration? I truly knew close to nothing about this topic. Every single page was helpful. Thanks! I will have a better evaluation of pediatric patients with possible thyroid issues. I learned a lot about the dosing regimen for propranolol usage in thyroid storm as well as using cooling techniques, and avoiding salicylates. Great information about thyroid concerns in peds. 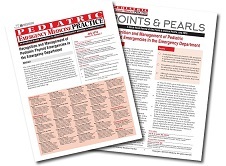 Good review of a topic that we don't see often in ED, but must be prepared to address. I will consider thyroid dysfunction in patients with new onset behavioral complaints. Appropriate work-up for accidental ingestion or overdose of thyroid medication in pediatric patients. I will check for thyroid abnormalities more often. This will improve my teaching. Thanks! I'll be ordering Thyroid studies on patients with palpitations and on patients with psychiatric complaints. Perhaps more on Down's syndrome youngsters. This is something I have only ever seen rarely, and it is remarkably difficult to get a good how-to guide on this topic in kids. This was an excellent article. I recently had this believe it or not and treated with labetalol first. I will not make that mistake again. I will consider thyroid disease as part of the differential in patients that present with various/vague symptoms, especially behavioral. I will consider of thyroid disorders in certain presentations and adhere to current evidence based guidelines. I'll now have a higher suspicion for hypo/hyperthyroidism in differential diagnoses in pediatric patients. Very good analysis of a difficult topic. I will have more confidence in managing patients outside the hospital with close follow up. Will understand emergent and non-emergent management strategies and when to employ them.